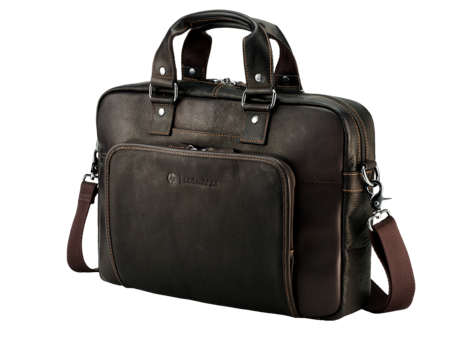 Padded compartment inside compatible for up to 14” mobile platforms. 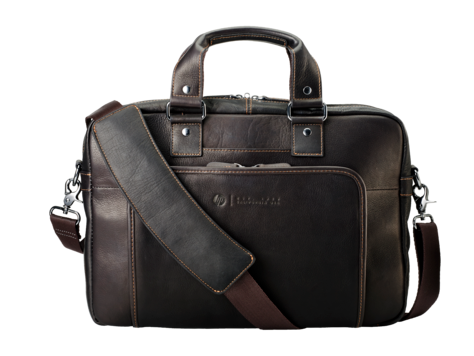 Set a new style standard when you’re on the move with the HP Elite Top Load Colombian Leather Case1, a beautifully lush full-grain leather bag that helps protect your devices and data and has ultimate expandability for your everyday essentials without the extra bulk. Defend yourself against the electronic data theft of your cards and personal identification with the RFID-shielded pocket. Deter tampering and access to the contents of your bag with the lockable zipper. Keep track of your bag and belongings with the optional HP TrackR Device2, which fits neatly into a discrete pocket and enables device tracking from your phone through a Bluetooth® connection. Use the main padded compartment for your device up to 14” diagonal, and the versatile foldout pocket to store your adapter, mouse, compact umbrella, and more. There’s even a mouse pouch, an external phone pocket, and an adjustable-length key clip. Throw the bag across your chest to keep your hands free, or carry by hand with the double handles. Commuting and traveling are easier than ever with a luggage pass-through pocket that fits over the handle of most rolling suitcases. 1 Case is composed of 92% full grain Colombian leather and 8% nylon. Nylon interior, web shoulder strap with shoulder pad composed of 50% top grain Colombian leather and 50% PU. 2 Sold separately see product insert. Compatible with iPhone 4s and later and Android 4.4 and later with Bluetooth® low energy. Availability varies by region.